Backpacking in Yerevan – the awesome staircase entrance to Penthouse Hostel. It has been a pleasure to stay in the best hostel in Yerevan while backpacking in Armenia recently. 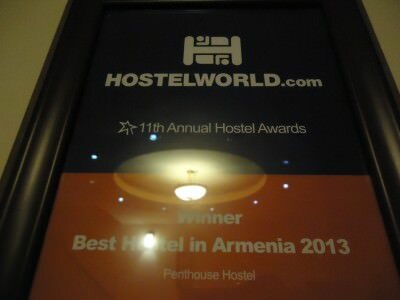 It could well be the first time I’ve stayed in a hostel voted best in the country (as recommended by Hotsel World). 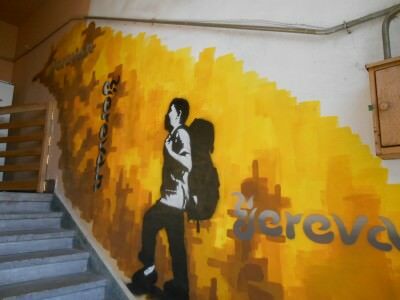 So if you ever find yourself in Armenia looking for a hostel, head to the Penthouse Hostel in Yerevan. Here are some of the top things about the Penthouse Hostel. Penthouse Hostel – number 1 in Armenia! The staff in the Penthouse Hostel know their stuff. With Artur and Yana in charge of the hostel, they know Yerevan very well. The staff on reception work around the clock for you, giving you all the information you need to backpack round the city and country. Thanks to Catherine and Mane for all their help too! 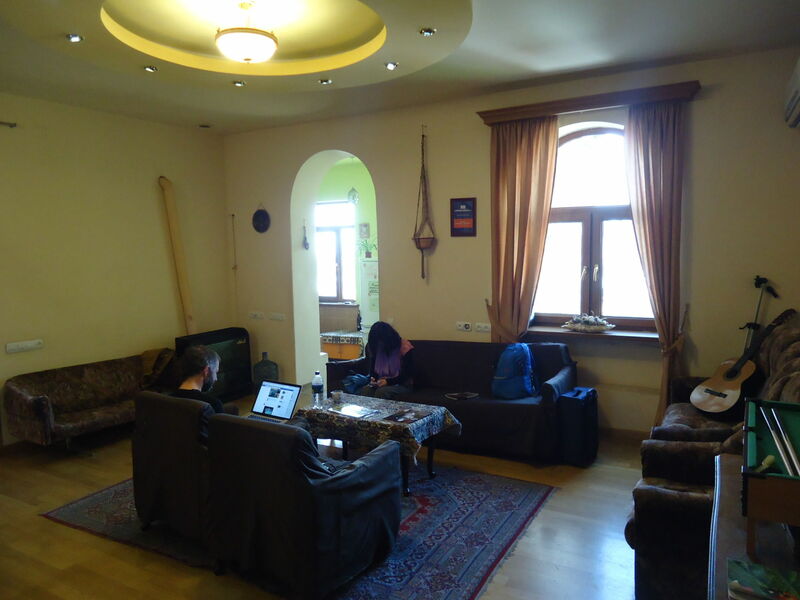 With Mane on reception in the Penthouse Hostel in Yerevan, Armenia. And a hot spicy smoked meal which is cooked on the fire then put in the frying pan. 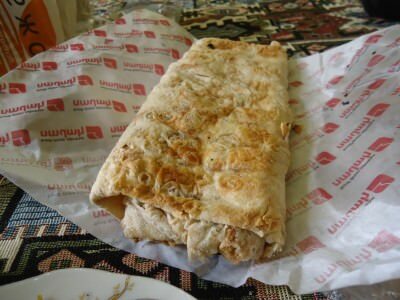 The taste was delicious and it’s made of aubergine/eggplant, tomato, pepper and butter. I hadn’t tried anything like this before and it’s great that Penthouse Hostel breaks the mould of normal hostels with boring bread and jam. Breakfast dish in the Penthouse Hostel in Yerevan, Armenia. And there is also a fried Khachapuri wrap which they gave us for breakfast. Cheese, tomato and it’s crispy. 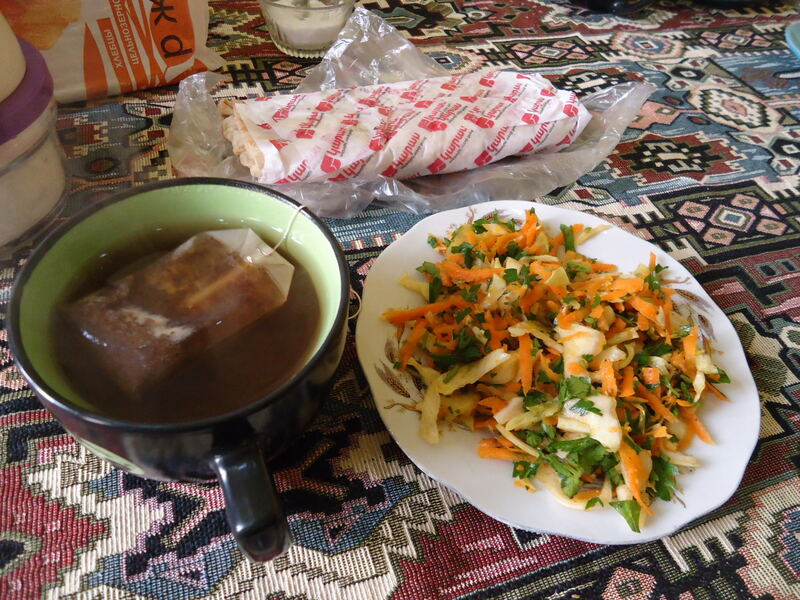 Breakfast is included in the Penthouse Hostel – a fried khachapuri wrap. 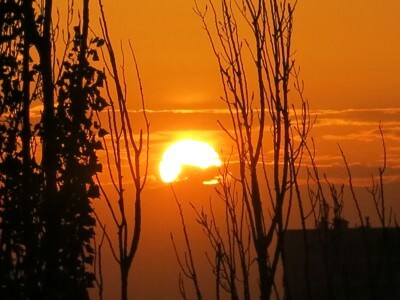 The Penthouse Hostel is on the 5th Floor meaning you can watch the sunset on the balcony. I had an ice cold beer doing just that on our first night here. The views to Mount Ararat from the balcony are also stunning. You’ll backpack a long way to find a hostel with a better view. Loving the balcony sunset from the Penthouse Hostel in Yerevan. This epic sunset I saw from the balcony of the Penthouse Hostel in Yerevan. If you’ve read my countless Tuesday’s Travel Essentials posts, you’ll know how much I love free laundry. Penthouse Hostel has it, and you can even leave your clothes out to dry on the balcony. Always a result! 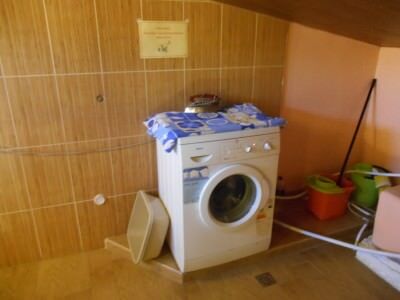 Free laundry in the Penthouse Hostel in Yerevan, Armenian. The lounge at Penthouse Hostel is a great place to relax. Comfy settees and chairs around a table along with a resident acoustic guitar make for just the setting you need on an evening on your travels. The cosy lounge in the Penthouse Hostel in Yerevan, best in Armenia. 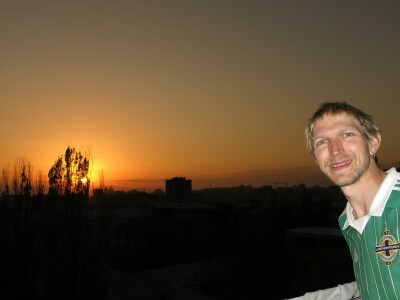 Perhaps this is a sore point for me as I completely went mental and overdosed on Armenian brandy while in Armenia and Nagorno Karabakh. 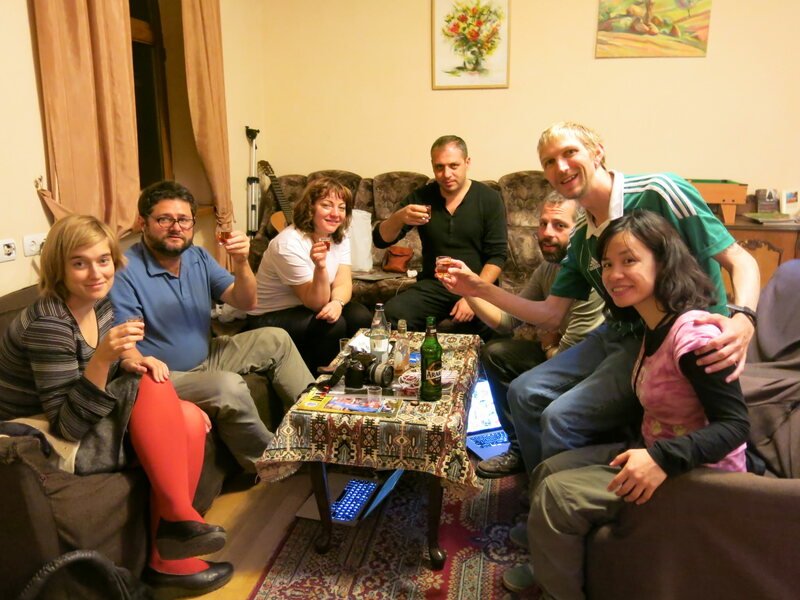 The owner of the Penthouse House, Artur makes it his duty to allow guests to sample the delights of Armenian Brandy. Yes, the brandy and cognac here is one of the finest in the world. Armenians are proud of it and you’ll enjoy drinking it with your hostel mates. However it’s lethal stuff, so be aware of that. Too much and you’ll be lying on the floor for a day. Brandy Night! Hostel party in Penthouse Hoste, Yerevan! 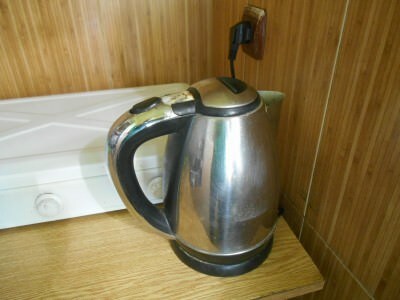 It’s a pet hate of mine for a hostel or hotel not to provide at least free tea and coffee. Luckily the Penthouse Hostel has it 24 hours a day, ideal for doing a bit of travel blogging or relaxing in the lounge. Free tea and coffee in the Penthouse Hostel, Yerevan. 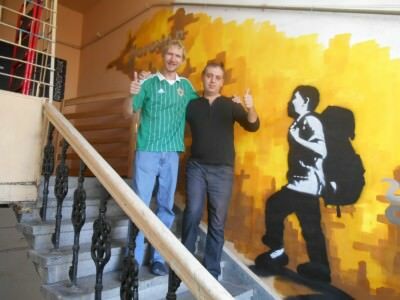 Drivers, tours and all sorts of detailed information on backpacking round Armenia can be found at Penthouse Hostel. They will be able to phone for a driver to take you almost anywhere you wish, including into Nagorno Karabakh. 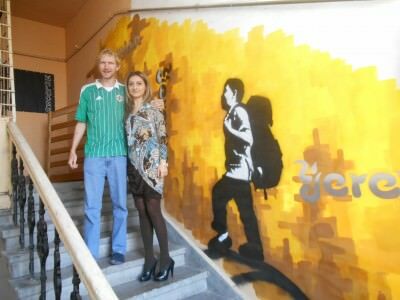 On the “backpacker stairs” at the Penthouse Hostel with Catherine. 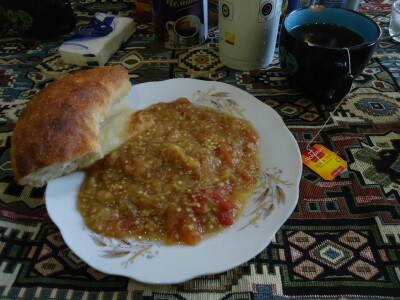 This entry was posted in Accommodation, Armenia, Central Asia/Middle East, Hostels, Yerevan. Bookmark the permalink.